Snack Girl writes a lot about cereal because it is one of those packaged foods that makes all sorts of health claims. For example, I believe a package of Cocoa Krispies had a "boost your immune system" statement on the front of the box. I will not even list all the things that are wrong about such a claim. It pains me to even walk down the cereal aisle because my children start demanding expensive cardboard boxes filled with "god knows what" with Sponge Bob on the front. Honestly, I don't have the time to stand there and determine what to buy. So, I buy a couple of cereals with no added sugar - Cheerios, Rice Krispies, Wheat Puffs, and I make my own cereal. You heard me! I make my own cereal (and, no, I am not related to Martha Stewart). Raise your hand if you make your own cereal! Hmmm, not so many of you. Why is that? Is it because you can just buy it and you know that you don't have time to make it? Cereal is ridiculously easy to make and the TASTE. You will never go back to a box of packaged cereal. I mean it. Whole grains are important for a healthy diet. They are SO important, in fact, that you should not trust Kellogg's to make them for you. The recipe below is a modification of an earlier DIY-cereal post on Snack Girl. I decided to change it to reduce the calories and increase the whole grains. You can also reduce the amount of sugar per serving by not including the dried fruit. It tasted great without it - it is just a matter of personal preference. You don't have to use almonds if you don't like nuts. Also you can use your favorite nuts - hazelnuts, pecans, walnuts, to make this cereal. The route to FOREVER with this recipe is to make it with different ingredients so you don't get bored with it. Find some time to make your own cereal and then tell me what you think. Puleeease! Do you make your own cereal? What do you put in it? Preheat oven to 325 F. Line a large rimmed baking tray with parchment paper. Combine the oats, and nuts in a large bowl. Mix the canola oil and honey and pour onto oat mixture. Spread on baking sheet and bake for 30 minutes. After it cools, scoop cereal off the pan and put in a bowl. Add the dried fruit and enjoy! Store in a air tight container in the refrigerator until you finish it. Sounds good and so much healthier! I think I'll make some today. Looks amazing!! i absolutely love granola!! i love putting it in my yogurt!! It never occurred to me that I could make cereal myself. Thanks for the recipe and the idea. Probably this will be something we will make at our house next weekend when we have time. Great idea! I don't really eat cereal (ate too much as a kid, I suppose) but the same concepts works for oatmeal. I get plain and add in my own mixes. You can make something different every day! Yummy... I started making my own granola recently. I adapted a WW recipe and use apple juice concentrate instead of the oil (cuts down on calories/points). I also tend to use it as a topping (on yogurt or cottage cheese). Well, you have my wheels spinning this morning. We have nut allergies in our family -- just the kids, and not severe. So, after reading your post, I had a flash of brilliance. I envisioned our "cereal shelf" in the pantry completely differently, and instead of seeing a row of boxes there, I can instead envision a container of toasted grains -- oats, quinoa, millet, etc -- along with containers of add ins like chopped apricots, raisins, cranberries, pumpkin seeds, sunflower seeds, nuts for those who can eat them, etc, etc, etc ... YUM!!! this sounds delicious! can't wait to try it! breakfast was always my hardest meal on weight watchers. i'd usually end up using my points on eggs and then i was hungry again an hour later. this sounds delicious and filling! This sounds great! My only hesitation is the amount of fat per serving. How much would it reduce the fat by using the juice concentrate that Maria suggested? Or is the fat mainly coming from the nuts? Sounds simple and good. Any suggestions on hi-fiber additions? Constantly searching for low/natural sugar, 10+ grams fiber cereals. Easy shortcut for me to my fiber goals for the day (and I need easy). Depend a lot on Uncle Sam cereal. Love it but gets boring. That's REDUCED in calories? 246 is a LOT for a serving of cereal if you're going to add milk or a milk substitute, fruit etc. for breakfast. Or do you have a really fast metabolism? THANK YOU! I've been using this recipe since you first posted it and have gradually been reducing the oil to see how little I could get away with. Now I know! Instead of dried fruit, I eat it with fresh fruit and plain Greek yogurt. I also change it up by using different nuts and adding in vanilla and ground flax seed. I even gave it as Christmas gifts! I love my cereal in the morning and actually look forward to it! My recipe isnt exactly homemade but its soo good and high in fiber. I use Trader Joe's Bran Flakes then add wheat puffs and a sprinkle oatmeal (not instant)on top. Then I mix them together. To top it off I add strawberries and blueberries and sprinkle cinnamin on top. It is my favorite meal of the day! Cocoa Krispies 'boost your immune system'? Since when!?!? I make pancakes(freeze them) and my overnight oats (which taste great up to 3-4 days) and just eat those on my weekdays but I am going to have to try this!! I'm bad at making granola...all my batches never work but I'm gonna have to try this! @Sue: That is NOT a lot of calories for breakfast. Some people eat 500-700 calories per day, but do not gain weight. Why? Because they exercise it off. @Kathy: "Some people eat 500-700 calories per day, but do not gain weight. Why? Because they exercise it off." I tried it last night and I have to say I am a bit sad!! I was praying it would be a great alternative to the junk the kids want. But it had this burnt aroma to it and it was very dry. It was hard to chew it too. Sorry but this recipe (for me) will not be a keeper. @Rosa - it is chewier than a regular cereal - but the aroma may have meant that it cooked too long. I'm sorry it didn't work for you - maybe you should try the recipe with more oil and honey - you may like it better (my kids like it better). I just made this, so good! I added a bit extra on the syrup and oil (I'm not calorie counting and am currently breastfeeding) I added a teaspoon of good quality vanilla and a few good pinches of kosher salt (I'm a salty/sweet person) Fabulous! I don't like dried fruit in my granola anyway, so that should save some calories. You show the points+ for the 1/2 cup without dried fruit - what would be the points+ for 1/4 cup without dried fruit? I like granola to top off yogurt with fresh fruit and have given it up since starting WW, but I'll try making this and hope it becomes my substitute for the high points stuff in the supermarket! It's not something I would eat everyday (like my grits with cheese and a poached egg) but would be great to have on hand for a treat. 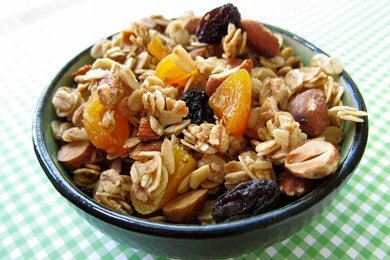 By the way, everything I've been reading lately praises the value of almonds in your diet, so I would definitely use almonds in this granola. Need healthy snacks for males. Also, need one's that are easy to do and don't require a lot of cooking. This is similar to what I make. I use cinnamon in mine and apple juice in place of the oil. Yum! On the cereal recipe can you use sugar free syrup . Please let me know. I am on simply filling weight watchers. Love the recipe. I believe that's also called "granola". I just saw this in the recent motivational weight loss article you did on lady who lost 100+ lbs. I have made the same cereal from another source and it is great only difference is no oil or honey. You spray pan with oil like Pam. I still get the great cereal taste. Love it. Will try this recipe though. I also make this cereal, almost exactly as you do, but use coconut oil instead of canola. Variations are endless, applesauce or pumpkin added for sweeteners, various extracts, etc. Sometimes tho I still long for basic cold cereals of the 50's and 60's. My family never bought sugary ''kid'' cereals for me and neither did I for my kids. But looking for healthy, organic cereal has been a challenge; I've sampled and tossed to the birds many a cardboardy-tasting so-called cereal! :) But for the past 2 years Eureka! I finally found a brand of organic cereal that I trust with great ingredients, nutritional value and lots of favorite types, i.e., corn flakes, O's, rice crispies, etc. And they all taste good. Its Nature's Path Brand. Take a look here and read some reviews if you too have a craving for some comfort cereals. P.S. Their "Smart Bran" has 13g fiber/svg! I've heard that canola oil is bad - usually GMO. If I made this recipe I would use coconut oil.